This document contains general information for employers in the concrete products industry on common sources of noise and on how the noise may be reduced. There are many different sources of noise in the concrete products industry which can result in personal noise exposures which exceed the upper exposure action value of the Control of Noise at Work Regulations 2005 (a daily noise exposure of 85 dB) and so need to be controlled. Vibrating tables or conveyors for compacting concrete in flat products such as paving slabs. 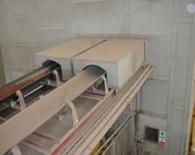 High levels of noise can be generated by the vibration generator itself and also from the impacts as the moulds or pallets rattle on the table surface. Vibrating presses for producing blocks and tiles. Impacts between pallets or moulds on conveyors or impacts due to falling waste material. If you think anyone may be exposed above the lower exposure action value of the Noise regulations (a daily exposure of 80 dB) you should assess the risk and plan your actions to control the noise to which people are exposed in your workplace. This will often involve measuring the noise, which should be done by somebody with the necessary training and experience. However, it is often possible to carry out a simple assessment to decide whether your employees are likely to be exposed above either of the action values. If you have to shout to be heard clearly by someone standing 2 m away, then the noise levels are likely to be more than 85 dB and a risk assessment will be needed if people are exposed for more than about 2 hours. Even if normal conversation is possible, if the noise is intrusive then it is probably 80 dB or more and if it lasts for more than about 6 hours you should have a risk assessment. The table below shows some of the noise levels that have been measured at worker positions in the concrete products industry. This information should help you to decide whether the lower or upper exposure action value is likely to be exceeded by any of your employees. There is a simple way to estimate a noise exposure from the noise level and the exposure time. If the exposure time is 8 hours, the exposure is equal to the noise level. If the exposure time is doubled (or halved) the exposure increases (or decreases) by 3 decibels. For example, if the average noise level is 95 dB and a worker is exposed to this noise for 8 hours, then his daily exposure is also 95 dB. But if his exposure time to the same noise level is only 4 hours per day, then the daily exposure will be 95 – 3 = 92 dB. Halving the exposure time again, to 2 hours a day, would reduce the worker’s exposure by a further 3 decibels, to 89 dB. Removing or reducing the noise at source, is the most effective way to control the risk of hearing damage in industry. It is more reliable, and easier to manage, than just using personal hearing protection and is often more cost effective in the longer term. You must reduce the noise exposure so far as is reasonable, if any daily noise exposures are above the upper exposure action value of 85 dB. There are several engineering approaches to noise control which are described below. Other Information Sheets in this series discuss in more detail how these techniques are used in the industry to reduce the noise from the processes involved in the manufacture of concrete products. The most efficient way to stop noise exposure is to do the job a different way, so that the noise is not created in the first place. This cannot be achieved over night, but when planning changes to a production process, or the introduction of a new process, it is often worth thinking about what will be noisy and whether this noise can be avoided. For example, in recent years there has been a large increase in the use of self-compacting concrete (SCC). This material flows into the corners of moulds by gravity alone and requires no vibration to achieve compaction. It therefore appears to provide a long term solution to employees’ noise exposure within the concrete production industry. Use of SCC in concrete products manufacture is unusual at present in the UK, but is widely used elsewhere, such as in Japan where it was first developed. It is recommended that you consider the use of SCC when planning future production methods; this could eliminate the noise generated by vibrating tables, conveyors and presses. Acoustic insulation is the use of a material to block the path of the noise from its source to people’s ears. The use of screens and enclosures are examples of insulation in practice. Screens may be rigid or flexible, as in the case of acoustic curtains/skirts. Whichever type is used, it important that the screens are continuous across the face of the path of the noise transmission, with no gaps in the screen. The screen should be placed close to the source or close to the employee’s position. Guards which enclose noisy plant can be turned into acoustic screens by making them solid rather than open mesh. If vision through the screens is required, they can be made from polycarbonate. Alternatively, the use of CCTV should be considered. the provision of a noise haven for employees, such as an insulated control room. In general, enclosures should be constructed from heavy, flexible materials which are the best for blocking sound. Enclosures will only work well if there are no openings or gaps which allow the noise to escape. Where materials pass in and out of, for example, an enclosure around a press, ‘acoustic tunnels’ can be provided to reduce the leakage at the openings, as in the picture above. Another important aspect of enclosures around noisy machines or processes is that noise is trapped inside, so the levels of noise will increase within the enclosure. This can be reduced by lining the enclosure with acoustically absorbent material (see below). Damping materials are used to reduce vibration in structures, especially flexible sheet metal components such as panels on machine casings, hoppers, chutes and skips. Reducing this vibration reduces the noise that is radiated by the vibrating surface. Damping material can be applied to the metal supports on the underside of conveyors where pallets drop, or onto any flexible sheet materials. The use of springs or rubber mounts to stop vibration from being transferred from a machine, such as a vibrating table or press, into the structure of the building or to another object (from which it could be radiated as noise. When two solid objects collide, the impact can be noisy. This is a common source of noise exposure in the industry: for example when pallets carrying concrete tiles collide on a conveyor or when materials fall into hoppers or skips. There are two methods to reduce the impulsive force between two objects impacting, and so reduce the noise of the impact. The first is to stop the impacts, or to reduce the speed with which the objects collide. This can often be achieved by careful control of conveyor speeds and by limiting the distance through which components or materials fall before they hit the bottom of a hopper, etc. The second method is to replace metal parts with components made from softer materials, such as polyurethane, which absorb some of the impact energy and produce less noise. Such materials can also be used to line metal chutes, skips, hoppers, guide rails, etc, which are subjected to impacts. Many processes in the industry use compressed air. A common source of noise is the exhausting of used air. Silencers are readily available and in some cases cost only a few pounds. Noise reduced air jets should be specified for all airlines and all air exhausts should be fitted with silencers. Reductions of at least 3 dB can be achieved by fitting a silencer to an air exhaust. Comparatively quiet jobs should be carried out in low noise areas, rather than in a noisy area. One company reported a reduction of more than 10dB in the noise exposures of some employees by moving a routine cleaning task out of a noisy production area. Finally, many jobs can being carried out in different ways, some of which will be noisier than others. You should identify the quieter methods, where possible, and train your employees to help reduce their own exposures.